The London School of Economics has made a collection of campaigning leaflets from the 1975 and 2016 referendums on the UK’s membership of the common market and EU available online. The collection can be browsed by referendum year, affiliation, organisation and subject. There are almost 40 leaflets for the 1975 referendum and over 180 from 2016. The collection is part of a wider archive of documents looking at Britain and the European Union. The images are not copyright free and are made available for research only. This collection is not available to search in iDiscover and should be accessed on the LSE website. This database contains news reports, television transcripts, and radio transcripts from around the world. The reports were chosen by a U.S. government agency called the Foreign Broadcast Information Service (FBIS)—which became part of the Central Intelligence Agency (CIA) in 1947–to be disseminated among government officials and decision makers. The reports begin with the refugee flows during World War II and cover all crises through 1996. The reports come from many nations and, where necessary, were translated into English. No U.S. newspapers or broadcasts are included in this database. Armenian refugees from Turkey carding wool in Tiflis, Georgia. Photograph by Melville Chater from the National Geographic Magazine, 1920. The Central Intelligence Agency (CIA) of the United States of America is required to declassify all records after a period of 25 years. These documents have been made available online in the CREST archive. Over 12 million pages have been made available as full text in electronic format. It has only been possible to view these records online from January 2017, previously access was only available on site the National Archives in Maryland. The CREST Archive is freely accessible and can be used by anyone. For a more detailed search you may want to use the U.S. Declassified Documents Online (USDDO) database by Gale. USDDO offers access to over 600,000 pages of primary source information from presidential libraries, the Department of State, Department of Defense, CIA, FBI, United Nations, and National Security Council, amongst others. The documents cover the period 1900-2008. Department political analyses, White House confidential file materials, National Security Council policy statements, CIA intelligence memoranda, and much more offer unique insights into the inner workings of the U.S. government and world events in the twentieth and twenty-first century. USDDO is provided by subscription and requires a Raven login for off-campus access. The University of Cambridge has trial access to the Krokodil digital archive until 15 May 2015. The essay below by John Etty of the University of Leeds describes the history and importance of the Krokodil magazine. Visit also the Krokodil magazine blog here. Krokodil was not unique in the 1920s—numerous satirical publications existed in the USSR at this time—but by the end of the 1920s, practical difficulties (including paper shortages), party efforts to reduce ‘parallelism’ (the existence of multiple publications with identical aims and methods) and ideological attacks combined to force all other union-wide satirical journals to close down. Before 1941, circulation remained around 300,000, but in the post-war period it peaked at around 5.8 million (in 1980) and was firmly established as one of the leading publications in the Soviet Union. In form, apart from variations in publication dates, issue numbers and length, Krokodil remained essentially unaltered until its final issue in 1991. Admonished in 1948 by a Central Committee decree, the Editorial Board regularized production so that for the majority of the postwar period, the magazine was a sixteen-page, four-color journal, published thirty-six times annually (on the 10th, 20th and 30th of each month), on newsprint paper. Satirical content was mainly found in political cartoons and poems, but also in articles, letters, feuilletons and other genres. Its status, as the only satirical journal published in the USSR, under direct Party control after 1932, leads to fundamental but as yet unexplored questions about the function of state-sponsored visual satire, official humor and popular responses to it, about artistic independence and working practices, and about the real extent of Krokodil’s popularity. Readers’ contributions, in the form of letters, cartoons and competition entries, and subscription numbers, but in the absence of empirical audience research and an accessible archive, the text itself remains the best source on the magazine. Krokodil emerged in the USSR at the moment of the creation of a national Soviet mass media, broadcast and communications systems, and its demise coincided with the expansion of the internet. Between these dates, Krokodil provided a mediated documentation of life in the USSR. The magazine often engaged with topics relating to the media and a fascination with the nature of the Soviet media system is evident in Krokodil’s texts and cartoons. Krokodil in fact represents an important and double-voiced discursive investigation of Soviet media and power: if it was not overtly critical of government policy or personalities, it was profoundly skeptical in its attitudes to the manifestations of Soviet modernism, despite being a product of Soviet modernity. It was critical of technology and over-mechanization, it ridiculed bureaucracy and excessive centralized control, and it was dubious about urbanization and collectivism. Perhaps more effectively than any other publication in the USSR, Krokodil fulfilled the social role of Soviet media imagined by Lenin when he outlined the newspaper’s importance in On Party Organisation and Party Literature (1905). In the 1960s, the magazine routinely received around five hundred letters per day, and some of this correspondence was published in the magazine. Since Krokodil was a publication that was co-constructed by professional and amateur producers, and the magazine may be understood as a mode of communication between government and populace. In a sense, since it was the result of collaboration between joint stakeholders, Krokodil may be understood as a kind of merged official-popular discourse. Krokodil was an important creative force in the visual language of Soviet graphic satire. Each issue contained an average of twenty-five cartoons, and the magazine’s prolificacy, as well as its numerous similarities with poster art, ensured that its contributions to visual communication were significant. Krokodil is considered by some to represent a type of ‘proto-comic’, and indeed its reliance upon word-image constructions to communicate meaning is an important part of its exploration of semiosis. Krokodil is much less studied than other Soviet visual media but no less central or influential. The magazine’s ephemerality and its tendency towards repetitiousness have perhaps devalued it in the eyes of some scholars, but Krokodil provides an important perspective on the cultural shift away from logocentrism, a trajectory more commonly analyzed through literature and film. In authoritarian regimes such as the USSR, humor is vitally important, and Krokodil’s humor is central to understanding the laughter in the Soviet Union. Soviet satire’s methods were mocking and ridiculing, and its targets were identified using Party ideology. The tone of its high profile, anti-western cartoons was didactic and aggressive, but a close study of Krokodil’s humor reveals a surprisingly playful approach that allowed for more interpretive freedom. A large and significant group of cartoon images satirized domestic topics, and it is important to acknowledge the range of political opinions embedded in them. Excavating dissident opinions and assuming perpetually faithful support would be two equally erroneous approaches to Soviet humor in Krokodil, since the magazine was always more complex. The function of affirmative official-popular satire, whether as a political weapon or as a social pressure valve, may be productively explored through Krokodil. Krokodil had, and indeed it continues to have, a loyal following. Satirists and cartoonists of various political persuasions cite its influence. Fan sites on social media websites, repeated attempts to revive the magazine, media interest in the magazine, its anniversaries and individuals connected with it, and the ongoing publication of a 12-volume history of the twentieth century told through extracts, all testify to the ongoing interest in and nostalgia for the publication. The publication of this digital resource brings the magazine closer to a scholarly audience and offers the opportunity to fill in the gaps in our understanding, some of which are identified above, and to gain a better understanding of the intersection of media power, politics and humorous popular engagement in the Soviet context. 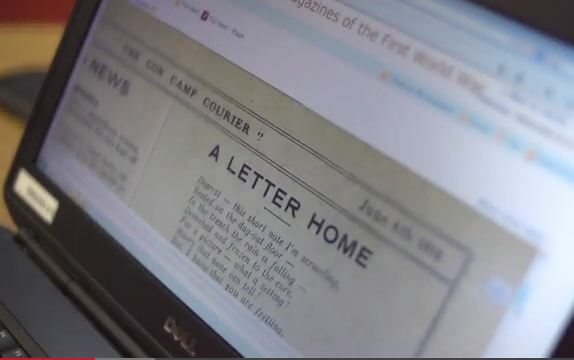 With events taking place to mark the centenary of the outbreak of the First World War an extension to the Adam Matthew resource The First World War has recently been added to the eresources@cambridge database A-Z. Focusing on the reality of the daily lives of individuals the database offers a range of primary source material relating to propaganda, recruitment and personnal experiences as well as interactive maps, essays and case studies. The primary sources include personal diaries, letters, journals, photos, posters and postcards. The digitised images of these documents can be viewed online or downloaded as PDFs. Material from the renowned War Reserve Collection from Cambridge University Library is included in this resource. This collection includes British, French and German books, periodicals, pamphlets and ephemera relating to the 1914-1919 war. Another resource covering the First World War is Europeana 1914-1918, a free digital resource funded by the EU, which now includes a learning site created by the British LIbrary. the upcoming centenary of the First World War has already sparked great debate and public comment about how we should remember and commemorate the conflict. The First World War: Propaganda and Recruitment is now available via the eresources@cambridge database A-Z or here. Trial access is available now until 29 November 2013 to Trench Journals and Unit Magazines of the First World War. Access the trial from this link.